One of the cornerstones of Milenomics is avoiding annual fees whenever possible. For my travel needs I have yet to find a card which is beneficial enough to keep and pay the annual fee on. Part of that is because signing up for cards again (especially in Two-Player Mode) is just so much more beneficial than keeping a card you already have. You might argue there are specific cards you know you’ll want to keep regardless of the annual fee. Even if you feel this way I would always suggest at least trying to have the fee waived. Even for those of you with very, very high T-Rates you’ll see with today’s example that the effort is more than worth it. Today we tackle the dreaded American Express PRG Annual Fee of $175. The Dollar signs cancel each other out, and we’re left with the number of hours we could work on achieving an annual fee waiver, in this case 7 hours. I wouldn’t actually advocate spending 7 hours on this, and as you’ll come to see you won’t need to spend nearly that much time. But for those of you thinking you don’t have time to spend on these waivers you can see that actually, you do. Dividing the potential savings by your T-Rate should help push you to attempt a fee waiver on all your cards. I tend to take a more subtle tact when I ask for fee waivers. Other people take a more direct approach. You can try one way, and if it doesn’t work you can Hang Up, Call Again (HUCA) and try the other approach. For a subtle push to work you need to have a convincing argument. In my case I’ve actually stopped using the PRG almost entirely. I hit it hard in Jan-March, and late last year, but stopped once my Wells-Fargo card arrived in ealy April. With this piece of information I crafted my reasoning prior to my phonecall. I wanted to cancel the card because I just wasn’t using it anymore, and I couldn’t see spending $175 for a card that’s sitting in my wallet. This is actually true. I find that the best negotiating is always done with the truth, in life and in miles. For those of you planning a call like this think back on the year–was something about the card not as promised? Was there an area where you were let down by customer service? Use the truth to your advantage, and put together a plausible reason why you’re cancelling. I called the number on my card and followed the prompts to cancel. I was connected with Scott, a pleasant sounding rep. I introduced myself and mentioned I wanted to cancel because I wasn’t using the card and noticed the Annual fee just hit. “May I ask why?” The rep asked. This type of engagement was a good sign, he was actively listening to me. Nothing is worse than when a rep starts to read off features of the card one by one and ask if you knew about these features…*cough* Barclay’s *Cough*. “I’ve gotten a new card and I’m using it more and more. I hate to say but it offers me more points per dollar, and has become my go-to card.” Again, all true. This guy was good. Really good. I’m sure some might have taken this bait, but I’m a #Milenomic, and I knew there were bigger fish out there. “Great, and remember this is on top of the 15,000 bonus points you’ll earn if you spend another $10,000 on the card this year. Things went well for me during my call, but lets take a moment to discuss what to do if the call doesn’t go your way. Should the rep you’re talking to play hardball and decide to not offer you anything you may find yourself needing to pull back from the cancellation at the last second. This go-around is a tricky maneuver because for the majority of the conversation you’ve been fully committed to cancelling. At the last second you need to pull up and abort the cancellation, and go-around for one more attempt (HUCA). Ask what will happen to my points when I cancel the card. This works best for Closed System cards rather than for Open System cards because the bank holds the points. The rep will tell you the points will be lost if you cancel. At this point you can then say you’ll call back after you transfer them out or use them. Ask if there is another card you can convert to without an annual fee. This works for both closed and open system cards. The rep will tell you more about a no-fee card, at which point I sound interested in it but say that I want to research it more before I switch to it. At that point I can hang up and call back again later. You could just say “oh wait I changed my mind,” but I’m a believer that everything you say with a phone rep has a chance of being written in the notes of your file. So “customer was not serious about cancelling” could end up being seen by future reps.
Friday’s call was very successful. I spent 12 minutes on the phone, which is $5 at my T-rate of $25/hr. In addition I was awarded 25,000 MR for my $175 annual fee. Or, I can take these points as an almost total waiver of my annual fee. 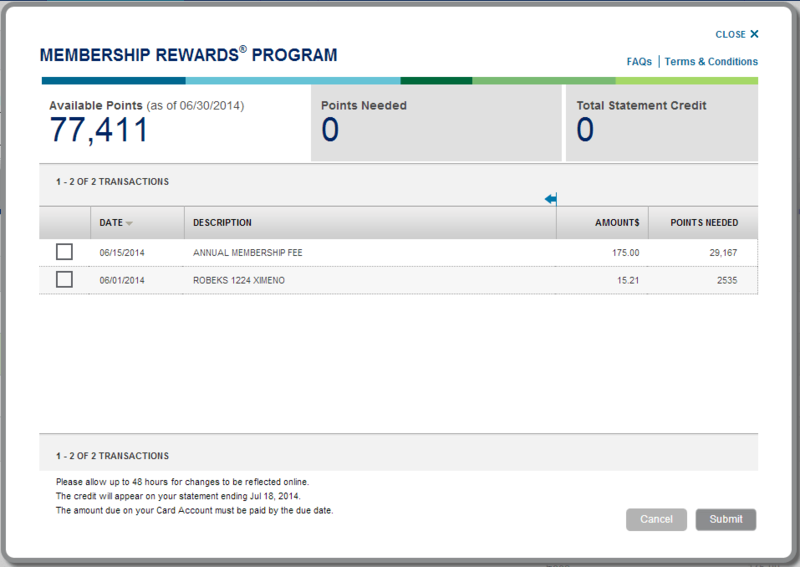 American Express allows you to take a statement credit for your MR points at a value of .006 per point. This is a terrible value, and not something I personally would do, but if you were cash strapped and still wanted to keep the card these 25,000 MR would equate to $150 in statement credits. . Employing this strategy would knock my annual fee down to $25. I can’t imagine a scenario where this makes sense, but I wanted to include it here to keep this post as complete as possible. If you have an upcoming trip or a short flight you know you’ll buy with cash this could be a good use of these points, and a way to offset your annual fee with planned spending. On the phone the rep said the points might take 4-6 weeks to post. The points have actually already posted to my account (see below). Technically I could transfer everything out and still cancel the card, earning 25k MR and refunding the annual fee. There’s too much value in earning MR with this card for me to do that. For those of you who don’t see the value in keeping a card, say a Platinum Amex, which I feel is nearly useless now, you could employ the above strategy. As you can see above spending your time on getting annual fees waived can be a valuable endeavor. The 11-month itch is a strategy I hope to see more and more of you employing. Paying an annual fee will never be superior to making money and miles from the bank which issues your card. Follow Milenomics on Twitter or Facebook, and if you’ve been successful in getting an annual fee waiver, or a big bonus to keep your card let me know. As always, an informative post. I just wanted to add that I do think the reps are to some degree limited in what they can offer, based on your spending on the card. I have had reps say things like “Let me see what offers pop up for you” and such, making me think that someone with significantly less spending would not be offered what you were. So while one could annoy a rep such that they don’t try to keep your business, the customer’s attitude and approach is really just a piece of the fee waiver game. I would also expect that the reps get evaluated based on how many customers they keep, so while they may try to keep you for a lesser offer, they will try to keep you, and will offer the best they can once you get sweetly persistent. Elaine: I agree the offers are probably targeted to some extent. A great thread on Flyertalk is this one: http://www.flyertalk.com/forum/american-express-membership-rewards/1290571-american-express-retention-bonuses.html Which lists bonuses people have been offered and each American express card type. Knowing what the current possible deals are will help you avoid those initial lowball offers the rep throws out there. I’m also in agreement that reps are evaluated based on how many customers they retain and at what cost, so there’s an incentive on their side to get you to take a lower offer. Agreed. For those about to call re: fee waivers for other cards, I have used the one on FT for CITI AA retention bonuses. It really does help gauge if the offer is decent and whether to keep pushing. I imagine there are similar links for many cards. Good luck! Well played. Great read (not to short or to long). Congrats. Congratulations on getting the retention bonus! Well played. I could not get an agent to offer anything to me or my husband. Probably, because I only put minimum spend to get the bonus. Actually, I agree with you for the most part. I am VERY picky about annual fees myself. So far, I only have my Chase IHG card, and that’s it. We just took my parents to Sanibel Holiday Inn, a cute place right at the beach. Retail rate was $179 per night. Is it worth it? No. But $49 per night? Oh yes! However, it is a case of YMVV We live in Florida, and have a choice of 5 beachfront Holiday Inns within driving distance. Even though I have a ton of IHG points, $49 is just too good of a deal! I just could not in good faith call and threaten to cancel. As far as other cards, I usually call and ask. If I ever get US Bank Club Carlson card, I won’t be calling, though. It will become a keeper till the program is gutted completely. Sam, I probably should send a message to Chase, but it just feels so wrong! 🙂 I have already taken thousands of dollars from them over the years. Yes, I am being irrational. Oh, and thanks for the link! I could not find a trackback to approve, it went to some sort of spam Neverland. Please, feel free to comment even if you feel it’s covered in my post. I always welcome your insights. Nice! I was not able to get my annual fee on my (wife’s) gold card removed, so I had to cancel it. Before I did though, I found a “magical” 50,000 points from the original signup bonus that they never gave me. I don’t know where or why it showed up but I was certainly pleased. I certainly think one of the reasons was that I had not spent anywhere close to the amount that you had on the card. That’s great! Were the points deposited after you called? Oso: push for that sign up bonus. I’ve had Amex cards for years and years, but never missed a signup because of different cards I’ve held. The points were deposited 2 business days after my call–the rep claimed 4-6 weeks, but it was much quicker in my experience. I spent at least an hour with various reps and departments when I opened the card in Feb/Mar. They said I signed up through a link without the offer though I sent them a screen shot of the offer I was pushing for — the measly public 25k… I grant that my app might have been reverted to the page without offer. I did not know then that they would not match better offers as eagerly as Chase. Then one rep had the gall to say I was churning cards — this was the first card I signed up for with sole intent of resell and GCs! This made me boil. I’ve been with them for 10 years and only cancelled one card. Chase really is amazing in matching offers, one secure message is all it takes. 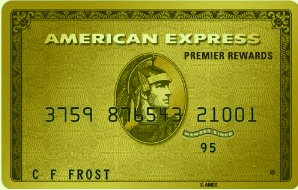 American express has not been so forthcoming… But I would still give it one last shot. Try the retentions department, explain what happened and how you expected more from a company you’ve done business with for so many years. If all else fails try the phrase, “what’s the best you can do for me in this situation?” which which might makes it hard for them to say “Nothing.” I appreciate you taking the time to outline your experience for others. I’m going on 5 months now with this card. Last month, I received the 15k MR bonus for spending $30k. Would they claw it back? If it was me I’d consider it still. Sure there is some risk of eyes on your account seeing something they don’t like. Just Keep it simple; You’re calling to find out where your bonus points are from you hitting your spending requirement. If they start down the “you don’t have a bonus offer tied to the account” road then ask how you can get the bonus offer you signed up for added to the account…That’s it, steer all other discussion towards that fact over and over. It sounds like you put quite a bit of spending on this card over a relatively short period of time, weren’t you worried about triggering the dreaded american express financial review? What are your thoughts on avoiding/dealing with the financial review. Jordan: Thanks for the comment. I’ll share a few of my feelings on the matter: While I did spend a decent amount on the card it was split between calendar years. In addition this card has a built in $30k yearly spending bonus built into it. That means the type of spending I’m doing is not out of the “ordinary” for this specific card. That’s not to say a FR wouldn’t/couldn’t be triggered at any time. I do think FR’s have taken on a bit of a mythological reputation for being these IRS Style audits. I know a few friends who’ve had them and, while not the most pleasant experience, they were allowed to keep their cards. In some cases where they had quite a few open cards credit limits were adjusted down. And finally some general advice: Never lie on a CC application when it comes to income. I make sure to put down my actual income as this seems to be the issue that Amex is most focused on in the course of a Financial Review. IMHO the question they’re looking to answer is, “did we extend the right amount of credit to this individual based on their actual real life income and debts?” Since all of us should have no actual credit card debt before playing this game we knock that leg out from under them, and they have only your income to look at. Rest assured, should a FR come around I’ll be documenting it clearly on this blog, and hopefully I’ll live to tell the tale! Meh. You handled it all wrong. No need to pussyfoot about. Just ask for Customer Service and ask for their best retention offer. It’s that simple. No need to make up a story – it doesn’t make any difference as your offers are not at the discretion of agents. All agents are trained to do is try and get dummies to accept inferior offers. So ask for the best offers. I made the same call last month on my card. I was truly intending to cancel the card. I hardly used it after making the minimum spend. I know I spent less than 10K on it. I was not going to pay the fee. The really didn’t expect to keep the card. I told the rep that I’d rather put my spend on my spg card. His first offer was 7500. I said no. He then claimed he’d speak with his supervisor. He came back with a 10,000 retention offer. So, I figure now the annual fee was $75 for me. I’m still not convinced I should keep the card. Right now it’s the only AMEX card I have that has MR’s. 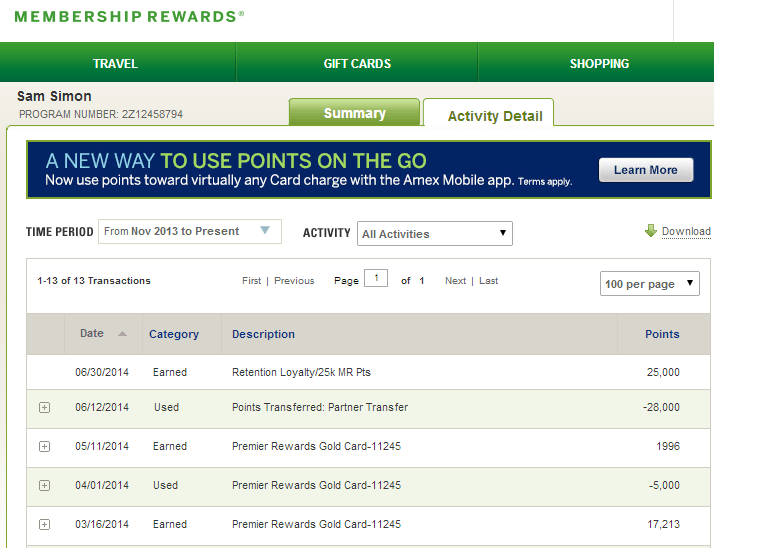 Are the amex bonuses now limited to one per lifetime? Manikandan: Personal cards have now had their terms and conditions changed to *say* there is a once per lifetime sign up bonus limit, per card. There have always been reports of people not getting Amex signups due to churning, and this may just be an extension of that. There isn’t enough data to say that universally if you had a specific Amex card, regardless of how long ago, you won’t get the new signup… so it is a very YMMV situation. If you had an SPG card 10 years ago vs. 2 years ago might make a difference, etc. I’d assume you won’t get the bonus until we see some good data as to who did/did not get bonuses come up in the next few months. In good news, Amex Business cards have no such wording change, and should be churnable over and over (in theory, again you could always be blacklisted somehow).